Doctor Who: Looking Back At THE TV MOVIE | Warped Factor - Words in the Key of Geek. The TV Movie: the one attempt to relaunch Doctor Who between the original series ending in 1989 and the new series beginning in 2005. 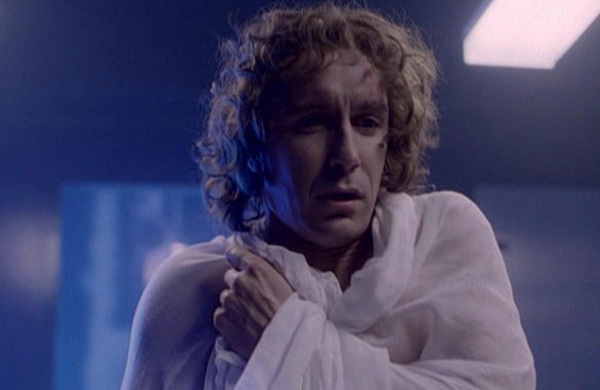 So long remembered as Paul McGann's sole TV appearance as the Doctor, or as that time the Americans ruined Doctor Who, the TV Movie was written off for a long time. It also faded into obscurity for many US fans due to the rights issues between the BBC and Universal keeping it from receiving first a VHS and then later a DVD release. With McGann's increased profile as the Doctor, thanks to his continued work with Big Finish and the 2013 Night Of The Doctor mini-episode, perhaps the time is ripe for a reexamination of the TV Movie? Perhaps we can finally see it as the comeback that should have been? 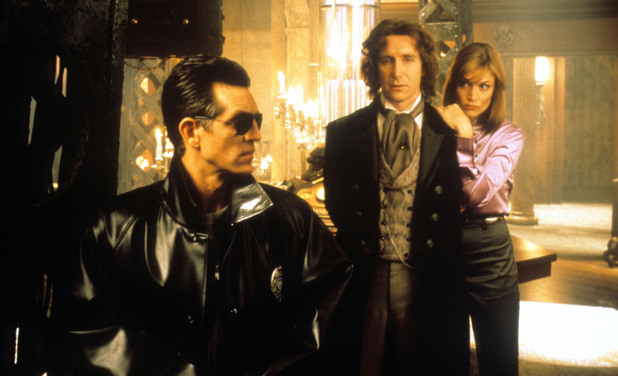 Perhaps the biggest highlight of the movie is that contains Paul McGann's debut as the eighth Doctor. 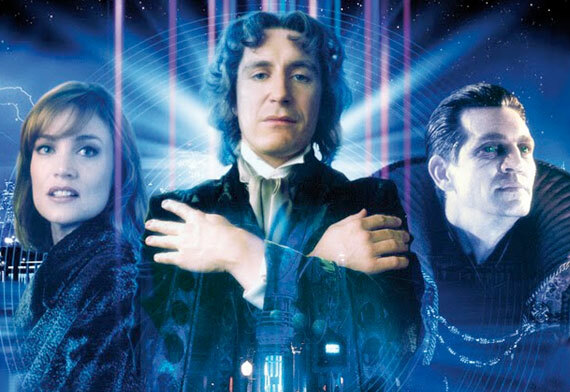 Some of the actors who've played the Doctor have found their feet after some time, others almost immediately and it would seem that McGann is one of the latter. From the moment he appears walking out of a morgue in a shroud to the last scene in the TARDIS drinking tea and reading H.G. Wells The Time Machine, McGann embodies everything the Doctor should be. He's eccentric, intelligent, melancholic at times, yet he's an all round watchable and likeable character. The American setting in fact highlights the eccentric qualities of McGann's performance even more. Perhaps the greatest shame of the TV movie is that this would be McGann's sole Doctor Who TV appearance for the better part of twenty years. There's also a good supporting cast backing him up. Playing the companion is Daphne Ashbrook as Dr. Grace Holloway who goes from a simple operation into an adventure with the fate of the world at stake. It helps that McGann shares some fine chemistry with her and the movie shines whenever they're together. Ashbrook also makes Grace's back and forth swapping about whether or not to believe the Doctor works despite the fact that it makes very little sense. There's also Yee Jee Tso who does an adequate job as Chang Lee. It seems the characters flaws are due in large part to the script rather than his skills as an actor. Not forgetting of course Sylvester McCoy's all too short appearance as the seventh Doctor in the opening minutes, even though his appearance seems rather unnecessary and potentially over complicates the film for anyone seeing Doctor Who for the first time (something that this TV Movie was supposed to be for). Which rather brings us to Eric Roberts as the Master. I must confess that I continue to be in two minds about Roberts' performance. 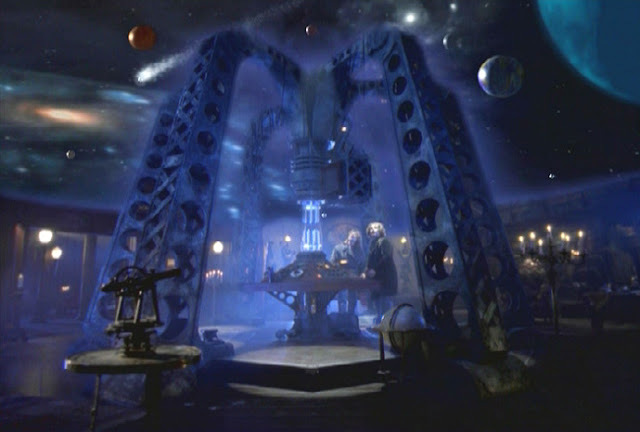 There are times when he is actually quite sinister, such as the scene when he initially meets Chang Lee in the TARDIS. Yet for the most part, Roberts is over the top at every given chance, such as the “I always dress for the occasion!” line for example. Sinister, yet over the top. Whether that helps or hurts the film is left up to the individual viewer to decide. The production values could easily rival almost anything that the new series produced during its first half a dozen seasons. Of particular mention is the music of composer John Debney's score, the first time that Doctor Who had gotten the feel of having a full orchestral score, including the excellent version of the Doctor Who Theme used in the opening and closing credits. The design of the TARDIS interior with its Gothic/Jules Verne, almost steam punk, feel is also of note. There is also the superb direction of Geoffrey Sax throughout the entire movie which does its best to ride the fine line between the Britishness of the series and the American setting, something in which it sometimes succeeds and sometimes doesn't. Which leads to the script. For something that was meant to be the launch of an American co-produced Doctor Who TV series it's surprisingly continuity heavy. For example, within the first few minutes the viewer has the Master, the Daleks, regeneration, the TARDIS and two different Doctors being thrown at them. The movie itself works well with its mix of humor and a good vs evil storyline as the plot heads towards the Millennium (remember this was shown in 1996) until the ending. While there's plenty of plot holes along the way (such as the aforementioned business with Grace shifting back and forth about believing the Doctor), for the most part though the story holds up despite those faults. Where does all of that leave the TV Movie then? It features a fine debut for the eighth Doctor, good performances from the majority of the cast and has some fine production values. While it has its faults, the fact that this was more or less a pilot does excuse some of them. Looking back on the TV Movie nearly twenty years after it was made one thing is clear: it was the comeback that it should have been.